In a remarkable farewell with songs, prayers, tears and standing ovations, a procession of Alaska Native leaders showered Gov. 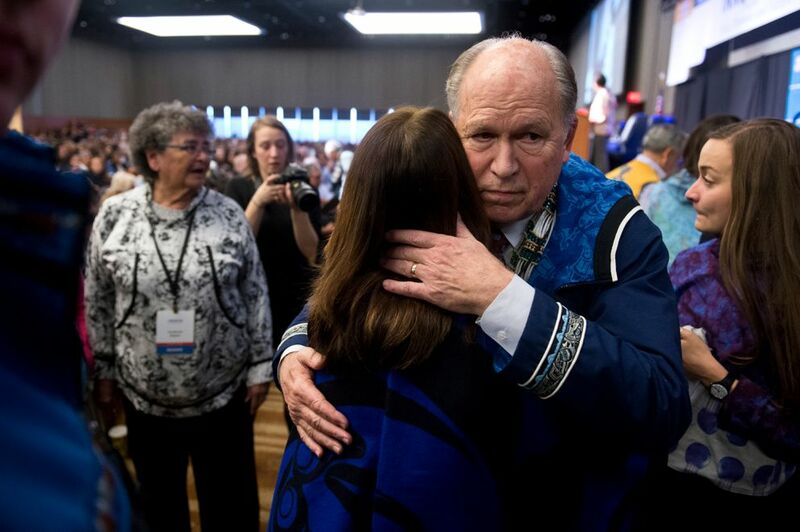 Bill Walker with praise and remorse after he stunned a packed convention floor on Friday, announcing his resignation from his reelection campaign at the Alaska Federation of Natives. Margaret Roberts, head of the Natives of Kodiak corporation, joined other Native leaders at the podium at the Dena'ina center in Anchorage. After crying, she serenaded the governor with a traditional Alutiiq song of gratitude, "Quyanaa, Quyanaa." She sang softly as Walker bit his lip and looked on, feet away. Roberts, trembling, embraced the governor during the impromptu goodbye ceremony before more than 1,500, what many called an unprecedented moment during an annual convention now in its 52nd year. 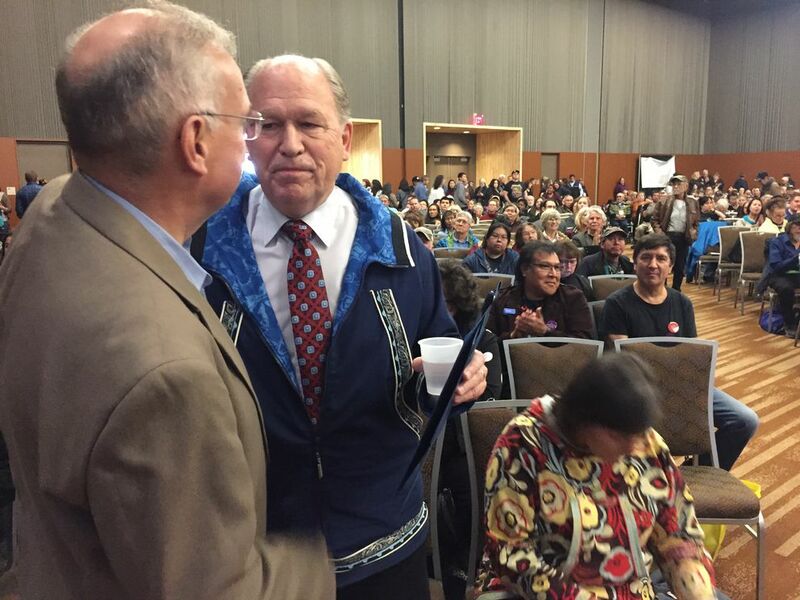 Roberts was one of a long line of Alaska Natives representing much of the state's corporate and tribal leadership that gathered on the convention stage following Walker's news. The touching event lasted half an hour. 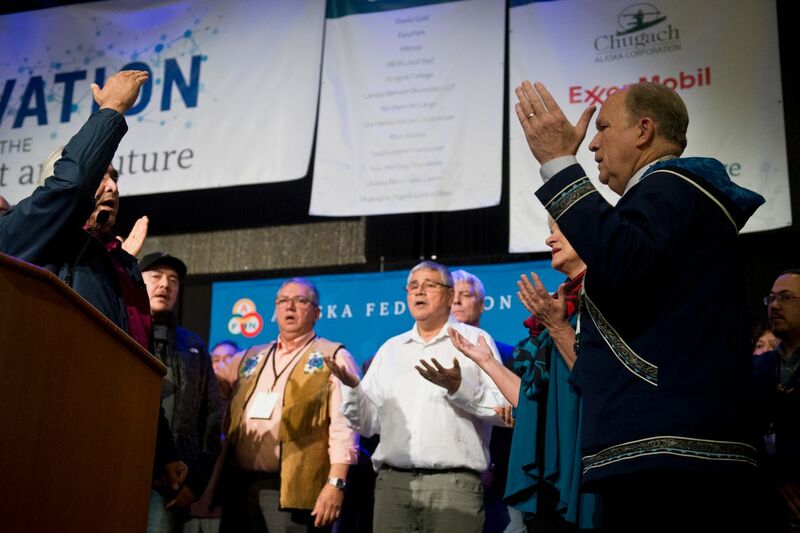 "I've never felt emotion like that (at AFN) to where you could cut through it with scissors," said House Speaker Bryce Edgmon, from Dillingham. "That was amazing." The governor, an independent candidate faced with low poll numbers and pressure from some Democrats, told the convention Friday he'd do what he believes is right for Alaska, stepping aside to clear a path to victory for Democratic candidate Mark Begich on Nov. 6, over poll leader Mike Dunleavy. Before Walker and his family could leave the stage, Native leaders began assembling on it. A delegate called for a floor vote, to accept the governor's apology, given Thursday, for historical wrongs done to Alaska Natives. Whoops and a long shower of applause followed: Acceptance was unanimous. Victor Joseph, chief of the Tanana Chiefs Conference, was one of three men at the podium who removed their traditional necklaces, draping them around the governor's neck. "You didn't have to doubt what he meant, because when he talked, he said what he meant," said Joseph. "You did the right thing," Ralph Andersen, chief executive of the Bristol Bay Native Association, told Walker. "Not only for you, and your family. You did it for us." Some leaders used the gathering as a call to action, urging the audience to get out and vote. 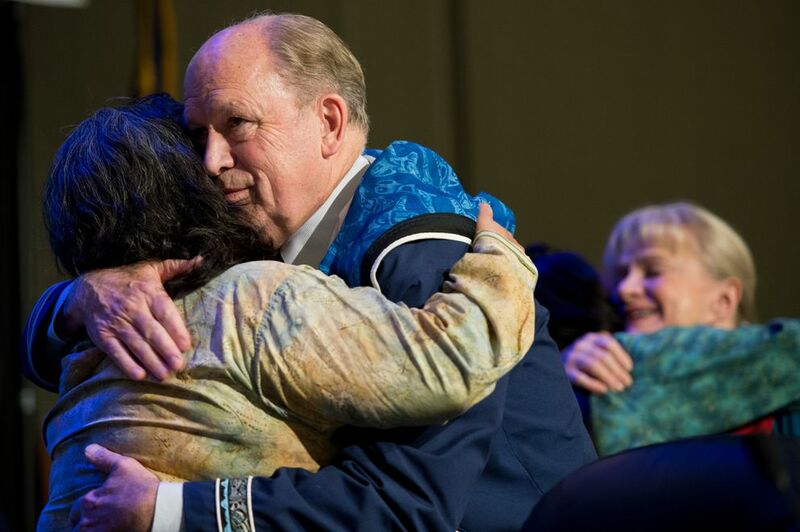 Walker is popular with Alaska Natives for such moves as accepting tribal sovereignty, expanding Medicaid that boosted health services, and putting Natives on his campaign ticket and in key administrative positions. P.J. Simon, vice-chair of Doyon Limited, a regional Native corporation, told a reporter that many Alaska Natives trust Begich, a former U.S senator. He's worked with the Native community for years, and they know that he's deeply familiar with their issues, Simon said. On stage, Simon gave Walker his bolo tie made of caribou antler, and a bear-paw emblem. He told Walker he fought for education and Native women and children. "This has special meaning. There's a lot of power in this necklace," he told Walker. Later, Simon told a reporter that such an outpouring of support was unprecedented at AFN. "Bar none," he said. "This day will live in history." The ceremony included prayers and statements in traditional Native languages, such as in Yup'ik. Leaders asked people from their region to stand in the audience as they spoke. "I can attest to your heart and your hard work and your caring for this state," said Wayne Westlake, chief executive of NANA regional Native corporation. "In my book, you're the greatest governor we ever had." Toward the end, many in the audience sang, "Hallelujah," palms raised. First Lady Donna Walker prayed from the podium as the audience bowed heads. She asked that hope outshine negativity. "We know it's the political season, Lord, and so we just pray that those things that divide us can not overcome the things that unite us," she said. The event ended on a lighter note, with cheering chants from one corner of the convention hall. "You have moved us," AFN co-chair Ana Hoffman told Walker. "You have lifted us to expect more and to achieve more. And for that we are thankful. You continue to make history with us."